Kant'S Practical Philosophy: From Critique To Doctrine: 9780333993996 Hardcover - LIMEROCK BOOKS INC. This work presents Kant as a vital revolutionary thinker, showing that his Practical Philosophy has been marred by views that it is formalist and centred on categorical imperative. Discussing his commitment to the notion of rational religion and his treatment of evil, this important study provides a vivid account of Kant's concerns. 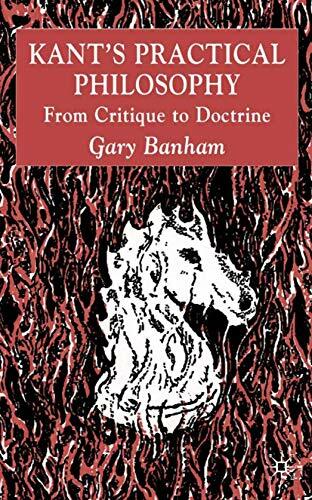 GARY BANHAM is Reader in Transcendental Philosophy at the Manchester Metropolitan University, UK. He is author of <em>Kant and the Ends of Aesthetics</em> and co-editor of <em>Evil Spirits: Nihilism and the Fate of Modernity</em>. He is also the general editor of Palgrave's<em> Renewing Philosophy</em> series.